Manufacturing methods have advanced with the advent of technology and so has the range of design. Jewelry is no exception. Even engagement rings have several sub-genres of designs and manufacture. One such design is the low-profile engagement ring. Keep reading to learn more about this type of ring. What is a Low Profile Ring? Side angle picture of a low profile engagement ring. The under-gallery sits very near to the diamond. A low profile engagement ring is an engagement ring that has a gallery that is equal to the size of the diamond’s depth. There are no standard measurements, but in general, a low profile ring shouldn’t sit above the finger by any more than 1mm over the depth of the diamond. 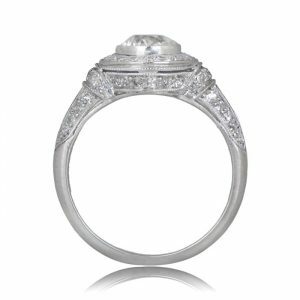 The center stone of an engagement ring commonly sits high and proud, displaying the diamond off to it’s fullest effect. However, many people have reasons to want a ring where the diamond and other stones are low-sitting. They could be wanting a ring that is less prone to snagging or they may be thinking about the job that they do. Some people just prefer to be a little more subtle than the higher-profile rings usually allow. Although there are exceptions, low-profile engagement rings will tend to be bezel set. 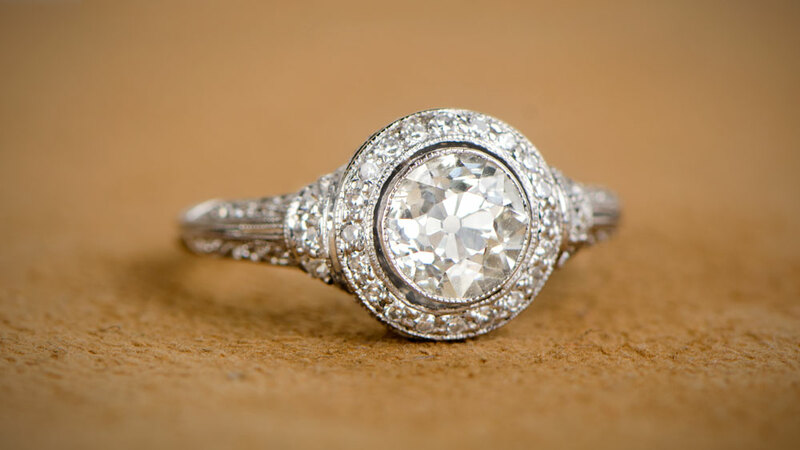 This doesn’t mean all bezel set rings are low-profile, but it would be unusual to see a low-profile engagement ring that is prong set, as the nature of a prong setting means that the center stone sits high in the overall design. 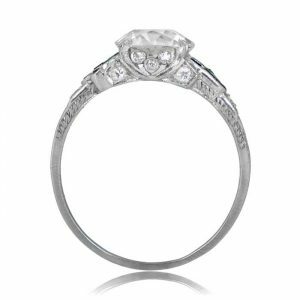 A primary example of a high set ring is the classic Tiffany style setting, which was designed specifically to counter the more traditional low-set bezel of the time and to show more of the diamond. Having the center diamond set low, however, doesn’t mean that they are dull or uninspiring. The bezel set allows more individual detail to be added. The low setting can display pavé around the center stone or contrast gems being set into the band. Indeed, in many ways, the variety of design elements that can be incorporated into a low-profile engagement ring can make for very interesting and eye-catching creations. Because of the removal of the need to work around a high-set center diamond, designers have been able to apply much looser rules to what should and shouldn’t be included in an engagement ring. Low-profile itself doesn’t mean “no-profile”, of course, as any stone(s) used will still be proud of the band. Low profile means that they will be low when seen in comparison to other high-profile settings. Low Profile Rings don’t have many disadvantages on a logical level. As mentioned above, having a low profile makes sense on so many levels. The main reason that many people will avoid low profile rings is that of the aesthetics. Low Profile Rings don’t show off the diamond, and if the diamond is important, the ring wearer will want everyone to see it. 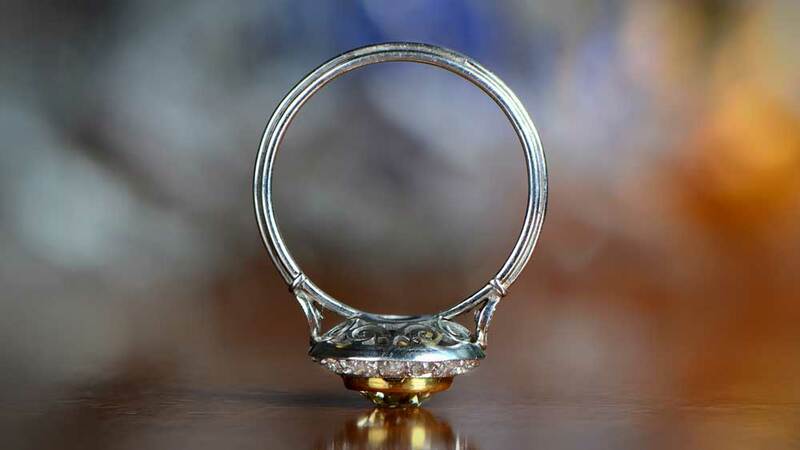 Another disadvantage of short gallery rings will be ease of cleaning. More hard-to-reach dirt tends to get caught in rings that are so compact. You may need to bring your ring a little more often to a professional ring cleaner (any local jewelry store). If you have an active lifestyle, a job that risks the ring being snagged, or just a personal style choice, low-profile rings are a perfect choice! Click here to view our entire collection of rare vintage engagement rings. Feel free to browse our collection of low profile engagement rings.